Democratize the world of art criticism. Digital technology and shared knowledge have redefined major parts of our society, including knowledge sharing, photography, music, and how we get the news. But that same sea change has never been experienced in art. That’s why we invited all people, from all walks of life, to participate in an experiment and express what specific works of art mean to them. We even designed an interactive installation in which the results of a shared opinion were seen in comparison to peers - in real time. That’s why we invited all people, from all walks of life, to participate in an experiment and express what specific works of art mean to them. 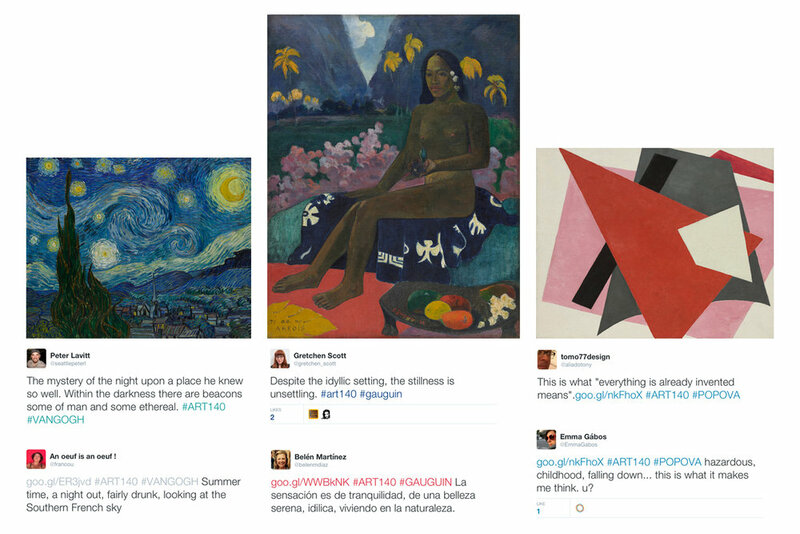 Analysis determined which tweets were the loftiest in tone as well as which artworks attracted the most of these tweets. When compared to tweets relating to entities such as celebrities and popular bloggers, ART140 tweets ranked at the index’s lower end, an indication of the decidedly human and straightforward way the art was referenced. The majority of tweets about ART140 were positive in nature. A work’s ranking on the index correlated with the artist’s composition and subject matter. Gauguin’s Seed of the Areoi ranked highest, partially due to its Tahitian backdrop. Different times of day evoked different emotions, with lunch time bringing the “happiest” of tweets. However, the greatest volume of tweets posted at night when the work day ends, especially for Van Gogh’s The Starry Night. We presented these insights at MuseumNext, a global conference focused on the future of art, technology and museums at large. We also designed and built an interactive art gallery during the Cannes Lions Festival of Creativity. Visitors who tweeted their opinions were able to see how they measured up against everyone else via an immediate printout, with the larger results revealed on the ART140 website to illustrate the conversations sparked among the masses.